Worthing Football Club secured their Bostik Premier League Division status for another season after they beat Merstham 3-2 at Woodside Road on Easter Monday. Home debutant George Barker, Harvey Sparks and substitute Ben Pope were on the scoresheet as Adam Hinshelwood's side stretched their unbeaten home run to nine matches. The hosts started on the front foot and had the first chance inside the first minute. Sparks blazed a shot just over the bar after some neat footwork on the wing by Reece Meekums. Despite Danny Barker being forced after 13 minutes due to injury Worthing continued to press for the opener, carving out another opportunity. Alfie Young lofted through to Jesse Starkey but his cross flashed across the face of goal, evading everyone in the area. Merstham grew into the game as the half went on and almost opened the scoring against the run of play on 27 minutes. Moatsiders striker Daniel Bennett found himself clean through on goal but George Bentley in Worthing's goal produced a great save to deny him. Worthing went 1-0 up four minutes later courtesy of a home debut goal by George Barker. Starkey swung in a free-kick from 25 yards out, which reached the back post before it was nodded across goal by Aarran Racine, giving Barker the simple task of tapping the ball home from six yards out. Chances during the remainder of the half were hard to come by for either side, apart from an effort from Merstham’s Sean Bonnett-Johnson but he placed his shot just past the post and Worthing went in leading 1-0 at the break. The Mackerels began the second half well and had a chance to double their advantage five minutes after the restart. Sparks and Starkey linked up with some tight, intricate play to slip through Barker, who fired narrowly wide from an offside position. A Worthing spell saw them increase their lead seven minutes later. A loose ball fell kindly for Sparks who drilled home put put the home side 2-0 up. Shortly after Worthing had the opportunity to go three goals up when Starkey’s inswinging corner found an unmarked Aarran Racine but he couldn’t aim his header on target. Merstham scored against the run of play in the 66th minute to put themselves back in the game. A cross found striker Reece Hall unmarked, who dispatched his shot into the bottom corner. Worthing managed to fend off a ten-minute spell of pressure from Merstham after the visitors’ first goal. The home side then restored their two-goal advantage on 76 minutes when skipper Darren Budd slipped through substitute Ben Pope, who acutely slotted the ball under Ashlee Jones in the Merstham goal. Budd had the chance to add a fourth for the Mackerels after Anesu Sisimayi laid the ball off to him on the edge of the box but he skewed his shot over. Merstham didn’t let their heads drop and scored in the 89th-minute with a header from Tutu Henriques to set up nervy last few minutes for Hinshelwood's side. But Worthing manged to hold on to claim the three points, leaving them in 14th position and confirmed their Bostik League Premier Division status for next season. 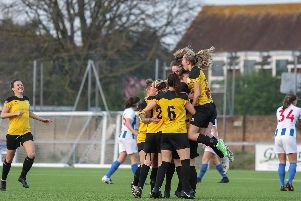 WORTHING: Bentley; D.Barker, Racine, Young; Parsons, Budd, Clarke, Sparks; G.Barker, Starkey; Meekums. Subs: Newton (D.Barker, 16), Pope (Starkey, 62), Sisimayi (Meekums, 77), Rance, Pamment.